ONE AI INTEGRATES CUTTING-EDGE MACHINE LEARNING CAPABILITIES INTO THE ONE MODEL PLATFORM, EQUIPPING HR PROFESSIONALS WITH READILY-ACCESSIBLE INSIGHTS FROM THEIR PEOPLE ANALYTICS DATA. One AI delivers a suite of out-of-the-box predictive models and data extensions, allowing organizations to understand and predict employee behavior like never before. 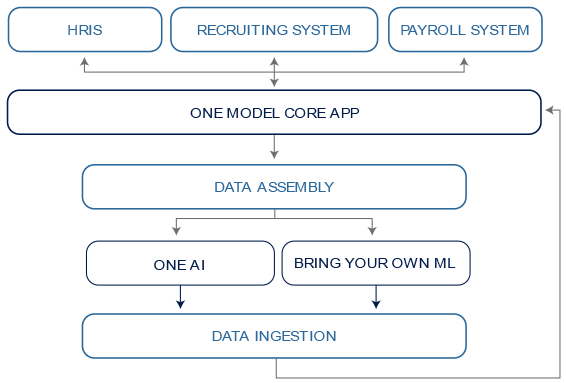 One AI extends upon the One Model platform capabilities, to allow HR professionals to access machine learning insights alongside their people analytics data and dashboards. One AI is open-sourced to allow customers and their partners to create and run their own predictive models or code within the One Model platform, enabling true support for an internal data science function. One AI’s ability to successfully incorporate machine learning insights into an organization’s people analytics strategy is significant. It means it’s possible to quickly and automatically produce models that can analyze bigger, more complex data and deliver faster, more accurate results. By creating more precise models, and augmenting internal capabilities, an organization can better identify cost-saving opportunities and mitigate risk. Our flexible, open platform allows you to use our tools or bring your own and run them in our infrastructure whenever data changes. Choose how you want to evaluate your models or let us choose for you. Pulls all data from systems in OneModel and parse into relevant timeframes. Systematically generating new features using domain experience. Analysis of all data in the system and steps to exclude dirty data and clean data that can be saved. Selects the statistically optimal subset of features for modeling. Allows users to manually include or exclude features (optional). Considers different lengths of time for training set (1, 2, 3 years, etc.). If label classifications are imbalanced, attempt to rebalance using preprocessing techniques. A set of models are benchmarked and tuned against the selected scorer. A detailed explanation of the selected model’s generation, including salient points from data engineering steps and performance metrics. Supports batch predictions and endpoint creation for live predictions. Now that you have the technical specs, let’s talk shop! Schedule a time to see One AI in action or share some of your own HR data and analytics challenges.